Memorial Day is almost upon us, which means summer has almost (unofficially) begun! I hope that doesn't mean your needles and hooks are collecting dust...On my queue? Tremont by Talitha Kuomi in a to-be-determined palette of Provence, Fairfax (scroll down for the link) from Twist Collective in Brass Button, my hands-down favorite Solstice color, and the Emily Shawl in Firefly in the Mermaid colorway. Let me know what you're knitting in the comments or share it with our Ravelry group! In the meantime, Classic Elite yarns are popping up in all my favorite magazines. See anything that catches your eye? Circle Jacket, designed by Cristina Mershon, knit in Classic Elite Yarns Fresco and Pirouette; 8 (10, 13) hanks of Fresco in #5353 Strawberry and 4 (5, 7) balls of Pirouette in #4058 Alizarin. Photo by Rose Callahan. Slit Shoulder Top, designed by Margaux Hufnagel in Classic Elite Yarns Seedling; 3 (4, 4, 4, 5, 5) hanks in #4575 summer rain(gray), 2 (2, 3, 3, 3, 3) hanks each in #4501 Summer Cloud (white), #4581 Mint (green), and #4546 Glacier (blue). Photo by Rose Callahan. 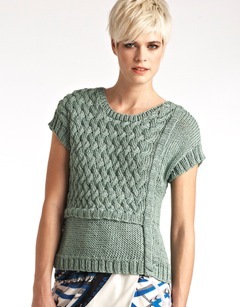 Cap Sleeve Top, designed by Twinkle in Twinkle Handknits/Classic Elite Yarns Cruise; 9 (10, 11, 12) skeins in #35 Mint. Photo by Paul Amato for LVARepresents.com. Striped Boat-neck Sweater, designed by Mari Lynn Patrick in Classic Elite Yarns Provence; 3 (3, 4, 4, 4, 5) hanks in #2601 bleached white, 2 (2, 2, 3, 3, 3) hanks in #2650 New Moon. Photo by Rose Callahan. I-cord Necklace, designed by Michele Muska in Classic Elite Yarns Chesapeake; 2 balls in #5919 carnation and small amounts each in #5955 Shanghai Red and #5925 Tokyo Rose. Photo by Rose Callahan. Picot Trim Dress, designed by Jil Eaton in Jil Eaton/Classic Elite Yarns CottonTail; 4 (5, 6, 7, 9) hanks in #7554 Lavender, 1 hank in #7520 Aqua. Photo by Paul Amato for LVARepresents.com. Hana Shell by Ruth Garcia-Alcantud in Classic Elite Yarns Soft Linen:, 5 (6, 7, 8, 8) balls in #2256 Lavender. Photo by Carmel Zucker. Robin Tank by Amy Christoffers, designed in Classic Elite Yarns Firefly; 4 (4, 5, 5, 5, 6) skeins of #7789 Pink Petunia. Photo by Nathan Rega, Harper Point Photography. 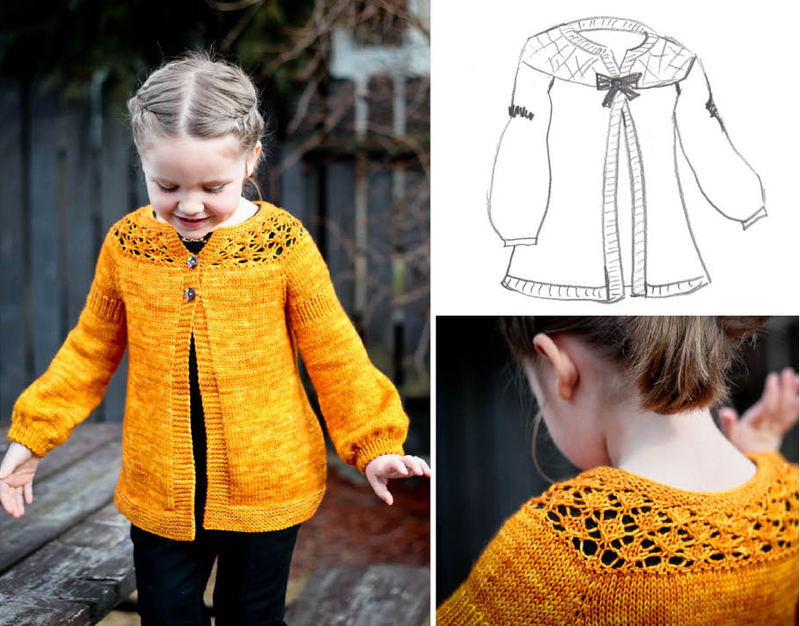 Merida Pullover by Talitha Kuomi, designed in Classic Elite Yarns Solstice; 6 (7, 7, 8, 10, 11, 11) skeins and #2338 Pine Cone, 3 (4, 4, 4, 5, 6, 6) skeins of #2358 Geranium. Photo by Nathan Rega, Harper Point Photography. Fairfax, designed by Tanis Gray in Classic Elite Yarns Solstice; 9 (10, 12, 13, 14, 15) skeins in #2332 Magenta. 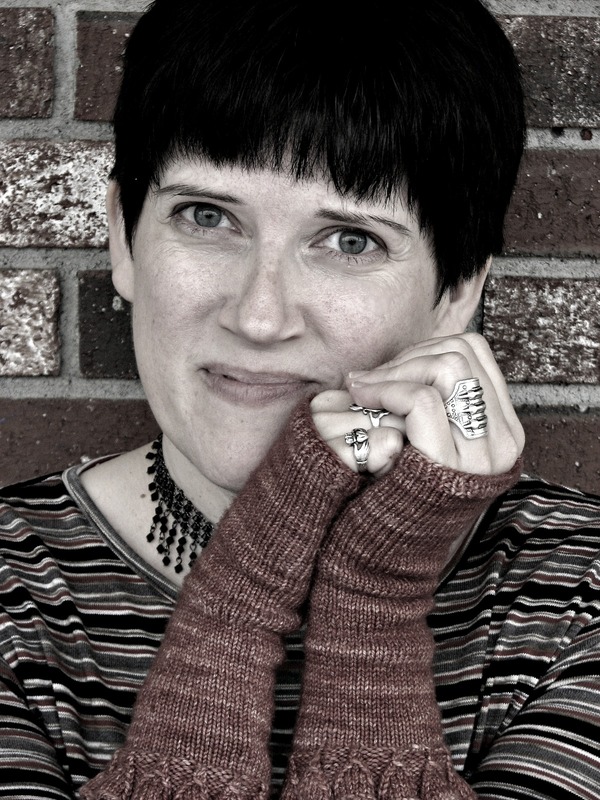 Photo by Jane Heller. 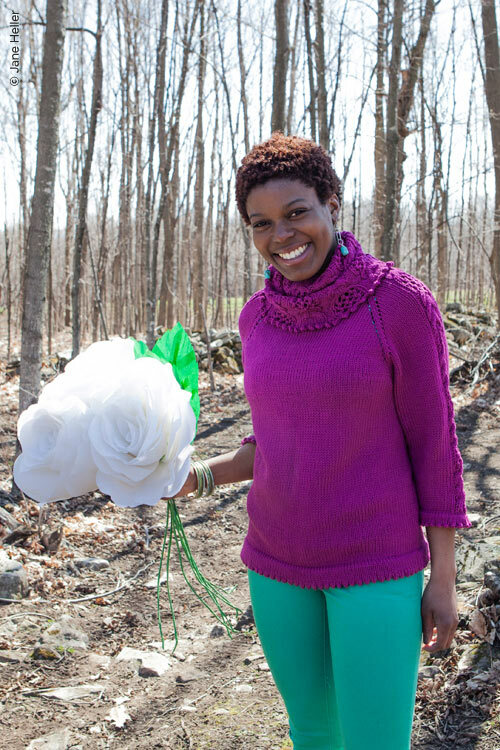 Petal designed by Heather Hoefle in Classic Elite Wool Bam Boo; 7, 8, 8, 10, 11, 12, 13 skeins in #136 Mulberry. My name is Elena Nodel, and I am a mom to a very industrious, busy, ever curious and adventurous little girl. Her name is Maya, and she is my ever present inspiration for all my creative ideas, and the spark that reignited my interest in knitting and designing. 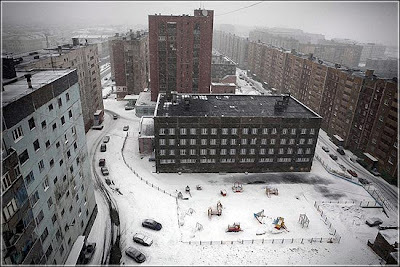 I was born and raised in Russia, a place where knitting is part of a lifestyle. It is not uncommon to see moms and grandmas knitting in the parks and playgrounds while watching kids play. As a child I was curious and fascinated enough with their work to actually sit and learn from the ladies. I made my first knitted piece at the age 7. 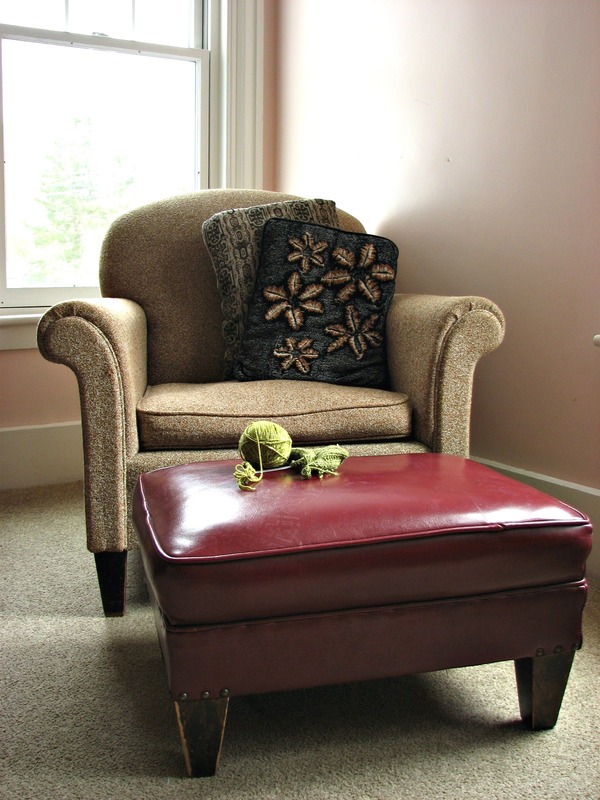 Afterward, I knitted a piece here and there, but nothing serious. 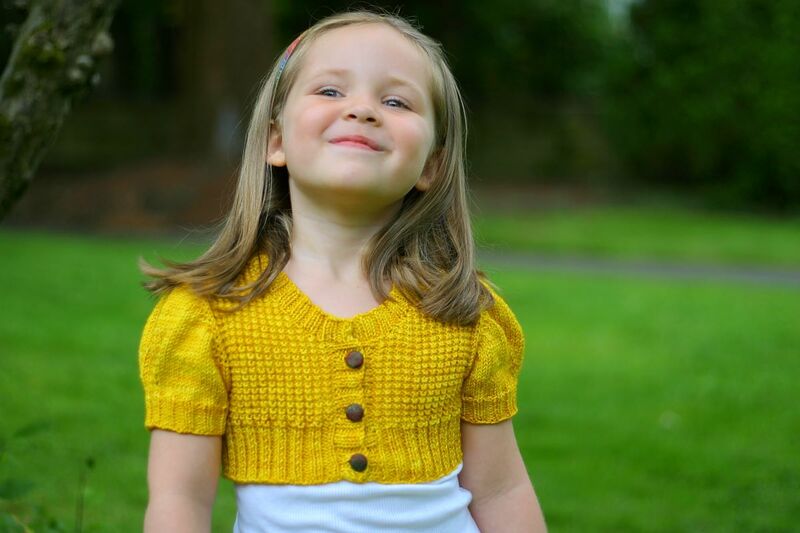 Only when I started knitting for my own daughter did my passion for knitting truly blossom. I am a trained microbiologist/immunologist, and have spent years doing scientific research. It might be surprising to some people to see me as a knitwear designer now. 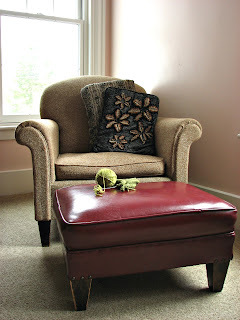 People that know me well were not at all surprised when after our daughter was born I became passionate about knitting. I have always been artistic and imaginative from as long as I remember. Kids wear is such a personal preference for parents, and I saw little in stores that I liked. So I picked up my needles again, and here I am, and I have been knitting and designing for the last 5 years now. My very first design was a sleeveless dress with some lace elements (Pink Lacey Spring Dress), which was dearly loved. I was so happy with my work, I absolutely had to bring and show it to Diane Debray, the owner of my favorite yarn store Wool and Wicker. It was Diane’s idea that I should make it into the pattern; with Diane’s positive feedback and encouragement over the next few months that followed I started to write down my patterns as my blog posts at first, and then started turning them into the actual patterns later. 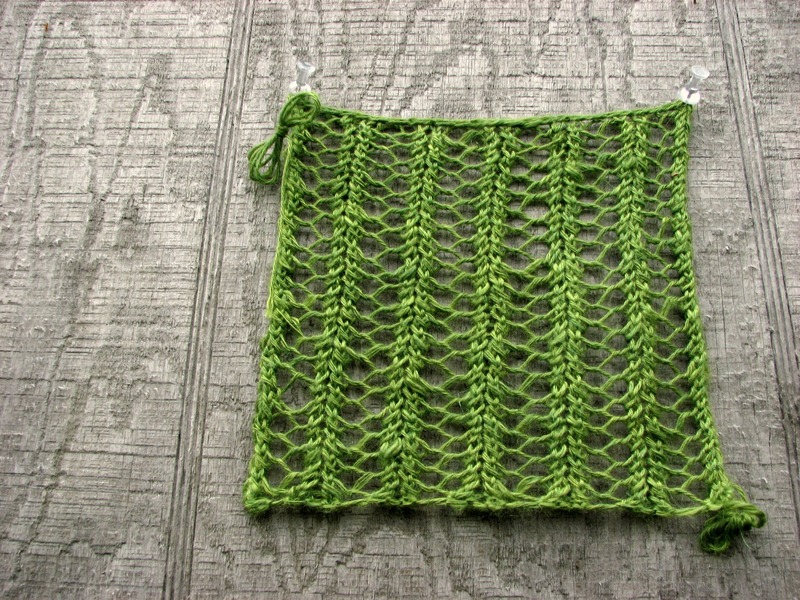 I discovered Ravelry, and initially used it as my knitting notebook. I was very surprised when others showed such a great interest in my work. My original patterns had only 1-3 sizes the most, and the number of request to upsize or downsize my patterns was overwhelming. So it was only natural to create proper patterns and offer them to the online world. I have learned a great deal over the last 5 years, and developed a new respect for all the designers out there, as writing patterns is not always easy and there is always a lot of background work involved that regular knitters do not see. Always! After my prototype is made, I write and size my pattern, then send it to my test knitters to make sure that my math holds to the actual test. Since my patterns cover sizes from baby to teenagers, I want to be sure that my adjustments for each age group are proper and the garment fits each age group as intended. I am very fortunate to work with a group of very talented knitters who test knit my designs, always challenge me to be a better writer, and trust my ideas no matter how crazy they might seem. We have a great dynamic and constantly learn from each other. Some of my designs would not be available in so many sizes without these wonderful people. As I mentioned earlier, my very first piece was Pink Lacey Spring Dress, however I did not feel like I made a proper design till I created Maxi Top/Dress. It was my first fully written, sized, and tested pattern. I wanted to create a design that would grow with my girl, that would be easy to knit, and easy to wear for a little kid. I think I have succeeded with my goal and more. 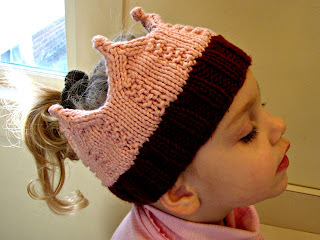 This design is the one I have knitted the most, both as gifts to others and as staple wardrobe pieces for my daughter. 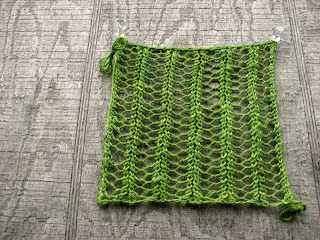 It was also my very first exposure to properly sizing a pattern. I remember being very intimidated by the process. Some designs transition from the idea to the garment easily; I sketch the idea, choose yarn, stitch work, do my math, and start knitting. Other patterns can take months to develop. 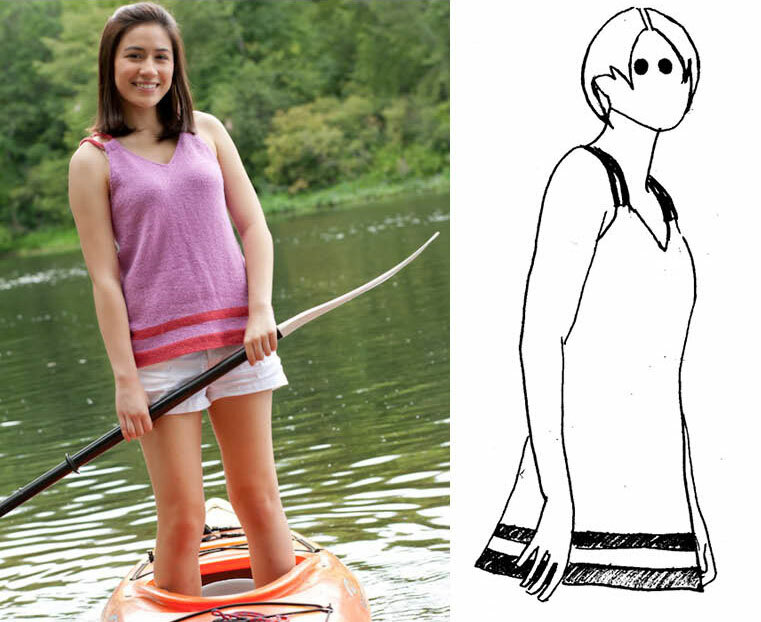 For example, it took me only 2 days for my Tropical Fish Skirt and Summer Days top to transition from the idea to the actual prototype garment. Yet, it took another couple of months to write, size, and test the patterns before they were presented to the knitting community. On the other hand, my Tomboy Cardigan was months in making. I had the idea long before I started working on the prototype, and I must admit that I lost some sleep over it, thinking of every little detail I wanted to be there. 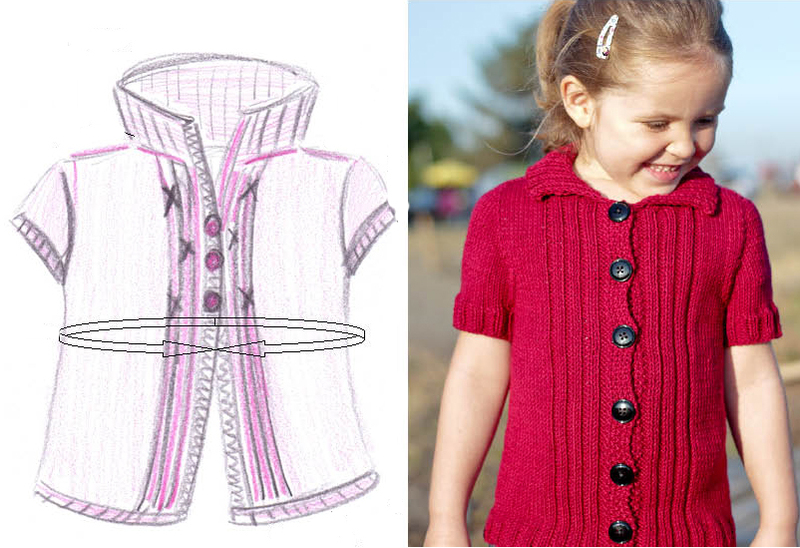 I had Tomboy cardigan in sketch form for about 5-6 months until I found a construction method that fit perfectly with my idea of what the design should be like. Since the construction method is fairly new (contiguous set-in sleeves), it took a couple of prototypes to finalize the design. 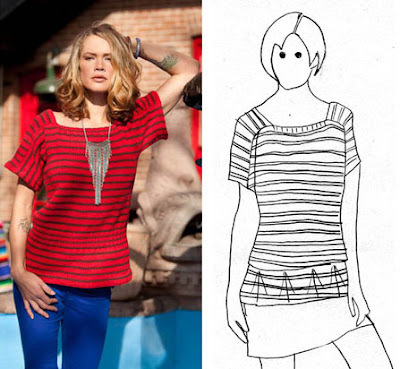 Overall the whole process for this particular design took about 8-9 months to transition from the original sketch to the fully written and tested pattern. What is your “design process”? I put a lot of thought and effort in each of my designs. My “design process” always starts with an idea and or inspiration that transition into a sketch. I do not start working on the prototype unless I am absolutely sure about every single detail that will go into the design. While working on a new design, I can spend hours looking for the right yarn and color, making several swatches. I would sometimes rip the whole garment out and start from scratch just because the construction method I chose was not working exactly as I envisioned, the elements I was trying to combine were not flowing together well, or the yarn I chose was not quite right for the project. 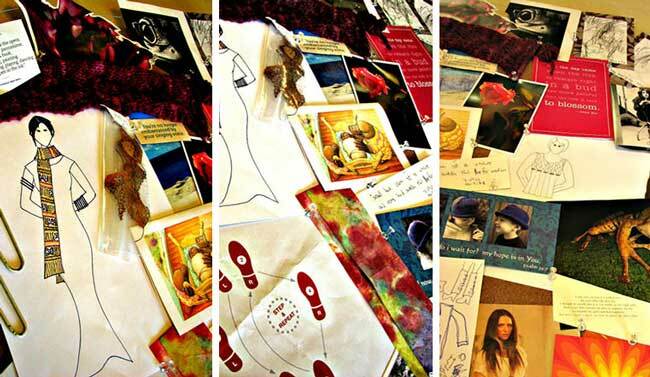 As you can see it is quite a process, but I thoroughly enjoy it, otherwise I would not be designing! One thing I don't like doing much is seaming, therefore I tend to knit and design in the round as much as possible or find ways to bring down seaming to a bare minimum. Nothing says Zen to me like being surrounded by lots of colorful yummy yarn. 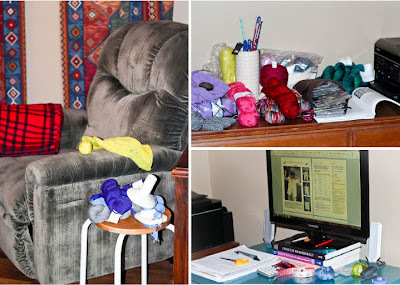 My knitting and yarn followed me everywhere in the house, or rather every room had yarn and one of the numerous projects I always have on the go. That was the case till I got my own work room! I have a computer desk that has my working notebook, markers, scissors, calculator, and measuring tape right in front of me. All my other tools and yarn for all the projects in progress are within an arm’s reach on a study desk next to me. I have a very comfy Lazy Boy chair, where I like to sit and knit, while watching Netflix on my computer. And of course, it is also surrounded by yarn and projects. What is your favorite piece you designed? What was your inspiration? My newest project tends to be my favorite, though I do have a couple of designs that stand out for me for one reason or the other. My newest release is “My Honey” cardigan for my Spice Girls 2 ebook. It was a bit challenging to design as I wanted to have lace yoke and at the same time keep it very simple for a large range of sizes. I found a very elegant solution and was very happy with the result. I would say it was one of my knitting experiments that went very well. My other two designs that I really love are “Color Me Pretty Hat” and “Fancy Guppy Skirt”. I love the hat because it provides the knitter with so many different color possibilities and fits. I have made 6 of those hats myself, and there will be many more next winter! I love the skirt because it is so “IN” right now with the fashion, and it is such a great stash buster for all the odd left over yarns. It also provides a lot of visual fun while changing and combining various colors together; the design lends so many different possibilities to a knitter. 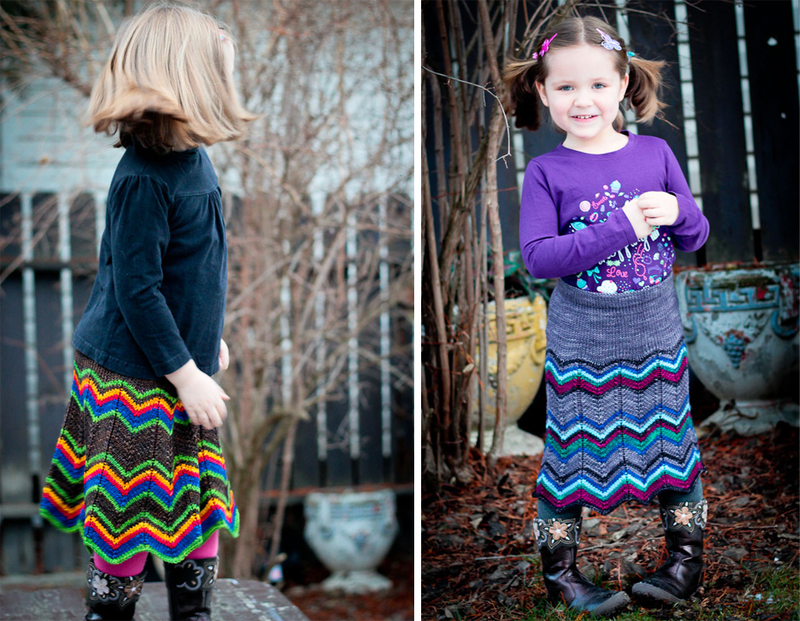 Another reason I love this skirt so much is because it was inspired by my beloved Missoni line. Follow your inspiration - there is no wrong or right, don’t be afraid to start. If you have an idea, write it down; you will be surprised how quickly you might forget it! If you are very new to the whole scene, find test knitters and treat them very nicely– they will help you a lot along your way, and who knows, you might build long lasting friendships. I sure did! 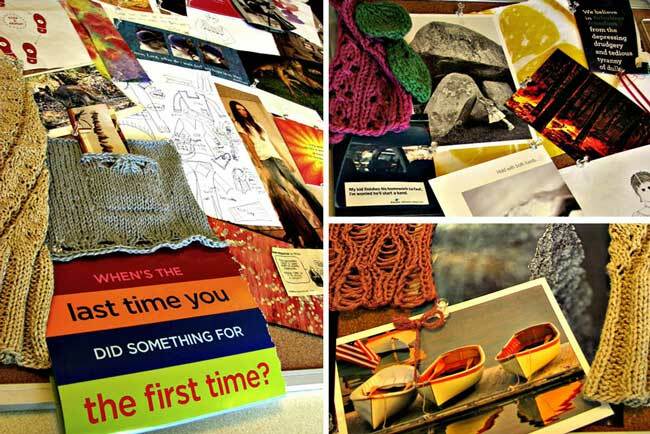 Designing knitwear is a constant learning curve; challenge yourself, do your research, but most importantly HAVE FUN! To learn more about Elena Nodel and her work, visit her website or her Ravelry page.